Labbits like carrots, but sometimes it's nice to dress 'em up with a little dip. Pipkin got word of a Sweet Potato Hummus recipe from Choosing Raw, a raw food website. (Oddly enough, the recipe calls for cooked potatoes and heated chickpeas. Hmmm...) The pantry did not have curry powder, but there was curry paste, so Pipkin made a note of the substitution in the recipe below. A variation in the instructions has been made, to allow for your own adjustment to the texture of the hummus. The original recipe can be found at the website above, and the version below can be printed out here. Don't forget to stir up your tahini if it has separated. 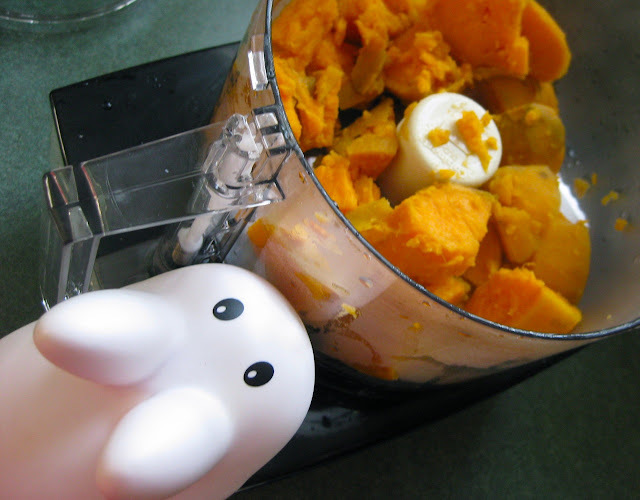 Place cooked sweet potatoes in the processor and puree for a minute, scraping down the sides of the bowl occasionally. Pour the chickpeas and their canning liquid into a little pot and get them warm. Drain, reserving the liquid. 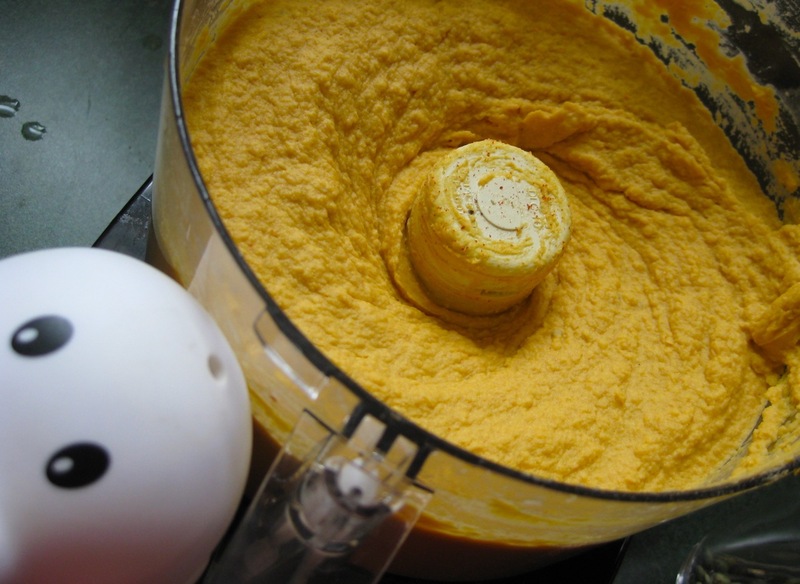 Place chickpeas into the processor along with the sesame oil, tahini, curry, salt and pepper. Run the processor. Add a tablespoon of the canning liquid from the beans (it’s got starch in it, which will help make the hummus super delicious) at a time and drizzle it into the processor to help create the perfect texture. If you run out of liquid but desire a thinner hummus, drizzle in water. Remember to stop now and then to scrape down the sides of the bowl. When the consistency is even, smooth, and thick but not pasty, you’re done. 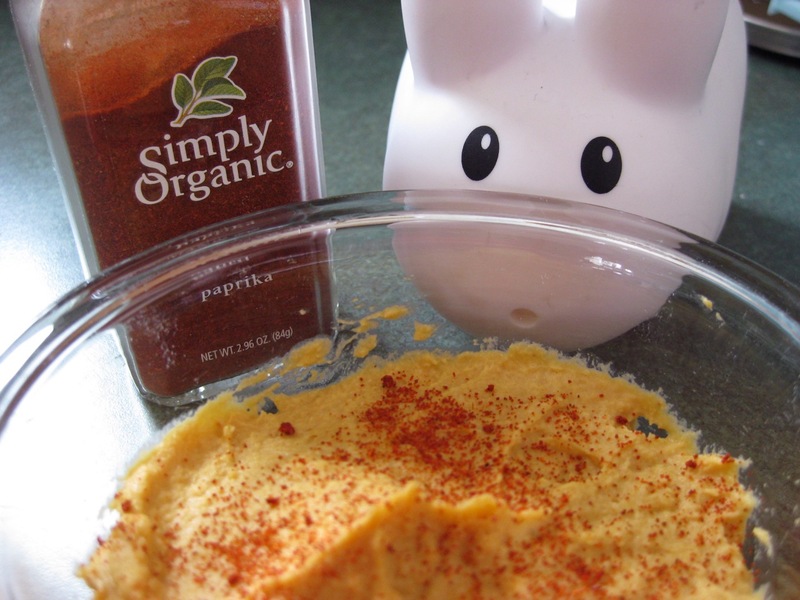 Sprinkle hummus with paprika, and serve. Mmmm, steamy hot sweet potaters! Ooooo...no sweet potatoes here, but I do have several butternut squash. Perhaps Dr. 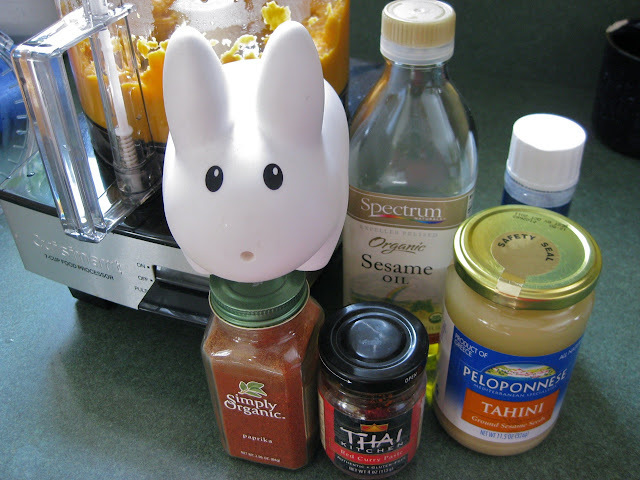 Duck and I will try a variation on Labbit's hummus. Nom, nom, nom.